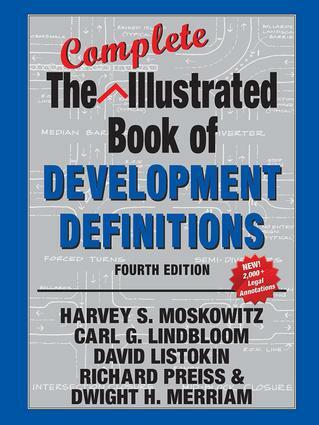 The latest edition of The Illustrated Book of Development Definitions breaks new ground. It addresses traditional and new planning problems: natural and industrial disasters such as hurricanes and oil spills; new housing types and living accommodations; changes in urban design and practice like new urbanism; sustainability; pedestrian and bicycle friendly environments; and more. Joining Harvey S. Moskowitz and Carl G. Lindbloom, authors of the first three editions, are two prominent, nationally known planners: David Listokin and Richard Preiss. Attorney Dwight H. Merriam adds legal annotations to almost all 2,276 definitions. These citations from court decisions bridge the gap between land use theory and real world application, bringing a new dimension to this edition. More than 20,000 copies of previous editions were sold over four decades to professionals and government representatives, such as members of planning and zoning boards and municipal governing bodies. This first revision in ten years updates what is widely acknowledged as an essential, standard reference for planners.